Ruth Warncke (1910-1998) was a national leader in adult education and served as Deputy Director of the American Library Association from 1965 to 1972. Her colleagues described her as “a professional feminist long before it was popular”. When the next supplement to the Dictionary of American Library Biography comes out she will undoubtedly be included. 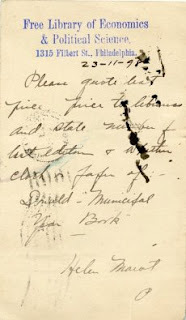 My decision to write about Warncke during Women’s History Month was prompted by a postcard (see above) I recently acquired for my collection of librariana. 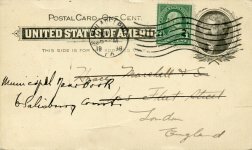 The postcard was mailed to Warncke in 1971. Warncke began her career as a teacher and school librarian in Glenview, IL and later held positions in public libraries in New York and Michigan. She was hired by ALA in 1955 to lead the American Heritage Project funded by the Ford Foundation to assist public libraries in discussions of American heritage. In 1956 she became director of another ALA national level project, the Library Community Project, which was designed to strengthen adult education activities and services in public libraries in the United States. In 1960 she left ALA and served on the faculty of Case Western University Library School until 1965 when she became Deputy Director of ALA. I’m always delighted to obtain a postcard that has a personal link to a librarian. 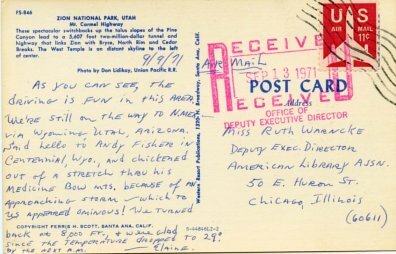 This postcard was mailed by a friend of Warncke who was traveling in the Southwest U.S.. The picture side of the postcard is a spectacular view of Zion National Park in Utah. I got the postcard at a stamp show from a dealer who was aware of my interest in library related postal items. Helen Marot (1865-1940) was a librarian who worked to improve the working conditions of women. She helped to establish the Free Library of Economics & Political Science in Philadelphia in 1897. 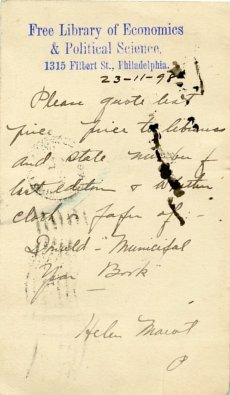 In my collection of library related postal cards I have a postal card (see above and to the left) that was mailed by Marot from the Free Library of Economics & Political Science on November 23, 1898 to a London publisher. In trying to find out more about Marot I was delighted to find a well written and researched article about her on Wikipedia. The article has a good description of the Free Library of Economics and Political Science which provided a specialized collection of government publications, labor society reports, magazines, and pamphlets related to economics and political science. Later Marot served as executive secretary of the New York branch of the national Women’s Trade Union League. Her labor activism included organizing the strike of the shirtwaist makers and dressmakers in 1909.